CARFAX can provide a customized data feed to meet any vehicle history need. You tell us your requirements and we'll set your business up with a seamlessly integrated data transfer system. 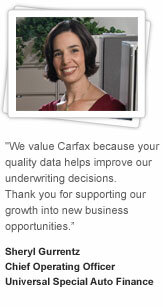 Contact us at 800-789-6232 to learn more about CARFAX customized data solutions.